Deciding on the best aquaponics complete system kit can be fun yet stressful if you don’t know what to look for when picking one out. This is why we’ll be not only recommending our favorite kits but also going over a lot of common questions & providing tips to help you out. The ECO-Cycle Aquaponics Indoor Garden System is a good choice for beginning hydroponics growers who want to get the hang of the aquaponics model. Aquaponics is essentially still hydroponics because it uses a soil-free medium and recirculates water to deliver nutrients to the crops. 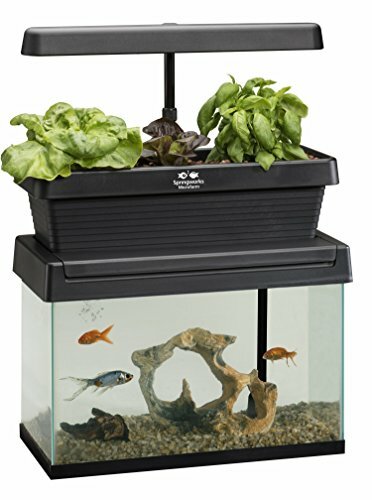 The ECO-Cycle Aquaponics Indoor Garden system was designed to complement any existing aquarium setup at home or in the office so that you can grow decorative plants alongside growing your fish. The model uses 90% less water, is streamlined and looks relatively good in any location and uses glazed glass so the water always looks crystal clear. The fish tank can accommodate up to 20 gallons of water, and water changes are almost never necessary as the plants will take care of cleaning the water for you. The system has also been automated. Large LED grow lights are installed on top of the grow bed to serve both as growth booster for the plants and to highlight the beauty of the aquarium/fish tank below. Take note that the light is LED and not HID and therefore, there will be generally less heat involved. HID lights can become very warm, but not LEDs. LEDs can also generate heat but because of their design, the heat dissipating from these lights will be much lower, but they would still be able to provide the type of light needed by plants to grow faster. The LED lights included have four growth settings and there are also timers to help you create a day/night cycle for both the plants and fish easily. The Aquasprouts Garden is another leading contender for a mini-aquaponics setup, owing to its block form factor, which is quite space-saving and is easier to meld into existing room layout. 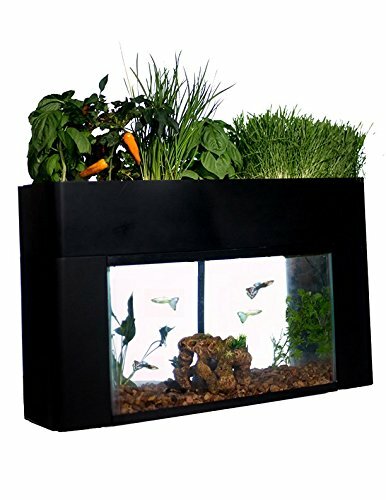 Aquasprouts Garden is in pure black matte finish and comes with several accessories. Aquasprouts Garden comes with a hefty number of accessories and features to make your foray into hydroponics/aquaponics as easy as possible. 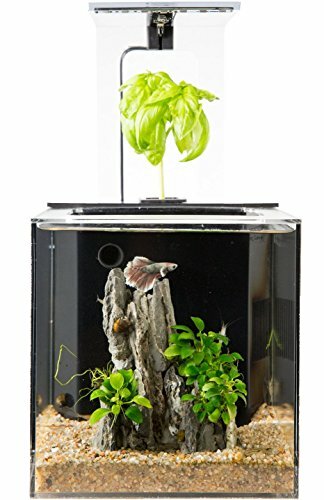 The tank is smaller than the previous setup; Aquasprouts Garden can hold up to 10 gallons of water. This means you can take care of less fish, but don’t let this fool you. Even a small number of fish can produce a large load of waste in a brief period of time; enough still to cultivate several adult plants easily. This model does not include its own HID/LED lighting. Instead, the package comes with a removable light bar where you can attach any two-foot lighting of your choice. This isn’t such a bad situation as you will then have control as to what type of lighting to use on your aquaponics setup. For the beginner we recommend LED lighting with automatic controls; just make sure that the model you’re buying was designed to grow plants as plants need a certain intensity of light to grow well indoors. The package also includes a 9.5-watt water pump to recirculate the water. This pump comes complete with a 24-hour timer and can be set to deliver water to the grow bed at fifteen-minute intervals or more. The manufacturer extends a warranty to both the pump and the separate timing mechanism. TIP: Feed your fish once a day or once every two days only. Too much food can befoul the tank. The Springworks Microfarm Aquaponic Garden is a good option if you already have a standard, 10-gallon aquarium at home and would just like to purchase an add-on to transform that plain aquarium into an actual aquaponics setup. The Springworks Microfarm Aquaponic Garden is made from durable, hard plastic, and comes packed with its own growth media. The rectangular grow bed has sufficient depth for any kind of soil-free media in case you want to replace the default media that comes with the package. It also comes packed with a direct-angle grow light so you simply have to switch on the light and the setup will take care of your growing lights for you. Below the grow bed is a small, low-wattage submersible pump that extends all the way to the bottom of your 10-gallon aquarium to deliver nutrients to the plants. This setup is a basic flood and drain system that delivers water to the grow bend and slowly drains it back to the aquarium through a restricted drain outlet. Included in the package are organic basil and oregano leaves, but you are free to purchase other types of seeds if you want to grow other plants in the grow bed. Low-height crops are excellent for this setup as the light bar is positioned just right for this type of crops. The Fin to Flower Aquaponic Aquarium is the optimal choice if you want a smaller setup but still want to cultivate vegetables or flowering plants indoors. 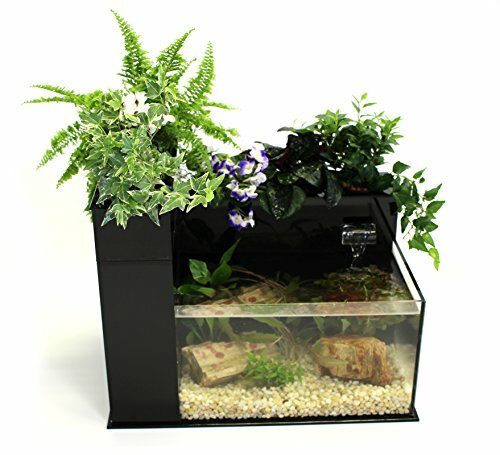 Unlike other beginner’s setups, the Fin to Flower Aquaponic Aquarium has an open top, with a waterfall design that drains the water from the over-the-tank grow bed. The pump system is hidden (instead of being positioned at the very center of the tank) L-shaped grow bed can support an average of 5-6 plants, depending on the sizes of the plants. 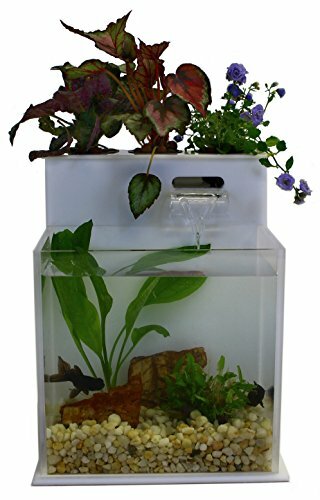 The acrylic tank is 19 inches wide and 15 inches tall, and 13 inches long. The manufacturer offers a lifetime guarantee on all its parts. The plant area also features a three-tier system, with three-inch plant, grow pots included. This setup features a five-gallon tank, which is smaller than the usual ten-gallon tank that other systems provide or require. Don’t worry: even with just five gallons of water and a few fish, you can still provide adequate nutrition to your plants. The beauty of this type of system is with less fish and water, maintenance becomes easier and you won’t have to worry too much about space constraints at home. The Fin to Flower Aquaponic Aquarium does not come with its own lighting system, though the manufacturer offers it as a separate accessory. You will get gravel for the tank, a dechlorinating agent, water pump and a built-in system filter to help balance the water as it begins its journey to being a sustainable ecosystem. Nothing beats cute, especially in hydroponics setups! The Fin to Flower Mini System A is even more appropriate for growers who have very limited space indoors or would simply like to raise a vegetable/herb or two indoors. While small, this system definitely still delivers, as it has all of the components of a working hydroponics system: grow bed, tank, and pump. Like other systems we’ve already featured, Mini System A is a basic flood and drain system, with gravity taking care of the water after it has been pumped into the grow bed. The almost jar-like appearance of Mini System A is perfect small apartments where it can be difficult to position ten-gallon tanks. Two gallons is relatively light, but it can still support a few fish and this is enough to sustain a handful of plants. The tank is 11 inches tall and 9 inches wide and is guaranteed to have no leaks for a lifetime by the manufacturer. The Mini System A comes with its own pump with built-in filter, gravel for the aquarium, a grow bed with soil-less media and individual grow pots for your plants. Everything that you need to get started with hydroponics is included, except the fish and plants. 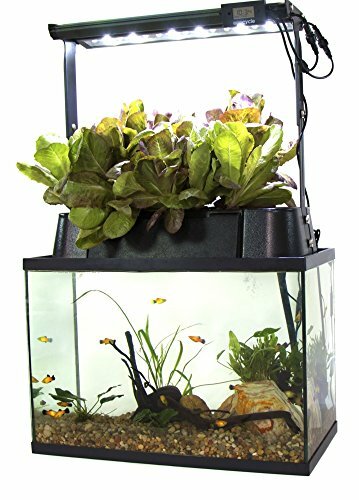 As for the fish and plants, what we recommend are herbs and leafy vegetables as these are relatively easy to grow and do not require much upkeep, especially in a small setup like this one. The EcoQuBeC is a small hydroponics tank that was designed to be more of an ornamental setup than a full aquaponics setup. The requirements of a basic aquaponics system are present, but the grow bed can only support one plant. The tank is small, designed specifically for bettas, which is one of the smallest ornamental fish around. EcoQuBe C comes with its own lighting system, remote and mini-pump to recirculate water to the plant and back. It is a flood and drain system with a pump submerged in the water and a channel to naturally draw back the water to the fish tank. The acrylic tank is very attractive and is perfect for bedrooms and small offices. Due to the focus on the ornamental side, you won’t be able to grow food with this setup but you will be able to understand how aquaponics works and how you can take care of both fish and plants in a single system. To keep the water balanced, the manufacturer has included an integrate biofilter in the system to ensure that neither plant or fish will succumb. The manufacturer recommends feeding fish three to six times a week, with an average water top off every month. Do not replace the tank water completely. TIP: Apply a dechlorinating agent to water during emergency tank refills. The Back to Roots Water Garden is an all-in-one solution for people who are looking for a truly compact hydroponics setup for their home or office. What’s interesting about the Back to the Roots system is it was designed to cultivate microgreens like wheatgrass. Microgreens can be grown fairly quickly, from the time of planting you will need only about ten days for a good harvest. Microgreens are often added to healthy shakes for added color and vitamins. Microgreens can also be added to salads and other dishes that require fresh and organic flavor. Imagine being able to harvest your own microgreens with almost zero effort as the aquaponics system will virtually take care of itself. That’s the power of aquaponics, even in small scale! The Back to Roots Water Garden has an elegantly curved tank that blends perfectly with any décor or motif indoors. It also comes with signature grow pods with media, suitable for growing small plants and microgreens. The manufacturer provides a 100% Guaranteed to Grow promise to all buyers as the setup will support small plant life easily and sustainably. 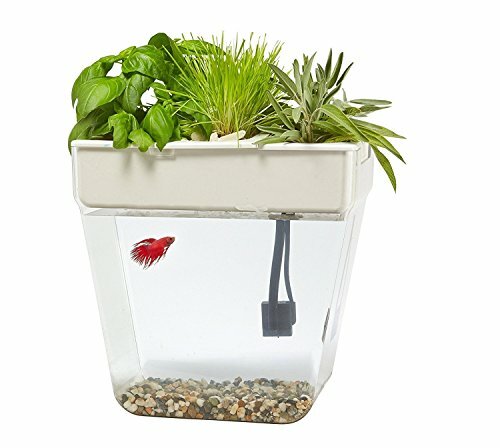 If you are already the proud owner of a betta fish tank, you can now upgrade that with a tank that knows how to clean itself while growing plants for salads and smoothies. This system is also excellent for kids who want to learn about gardening as it’s easy to handle and maintain. TIP: Remember to bring a little water from the pet shop to add to your water at home before introducing fish. Aquaponics is a type of hydroponic system that delivers nutrient-rich water from a fish tank. In a conventional hydroponics setup, the grower needs to mix nutrients in the main reservoir so the plants can survive. In an aquaponics setup, the fish tank provides the nutrients while the plants make sure that the tank doesn’t overflow with ammonia, which can be toxic to fish in large quantities. Ammonia comes from fish waste and is the number one problem in fish tanks. Plants, on the other hand, have the natural capacity to remove ammonia from the water while working together with the beneficial bacterial from the fish’s gut. Hopefully you found something you liked in our lineup the best aquaponic system kits. Another option if you don’t like to raise betta fish in your tank is to raise shrimp instead. Shrimp can just as well provide the nutrients to the plant up top and you get to watch them swim about in the clear acrylic tank.